I work with many quilting magazines to develop and publish new modern quilting designs. These patterns aren’t in my shop yet, but stay tuned! If you can’t wait for the re-release, the issues each quilt appears in are linked to in the boxes below the description. Image by QuiltCon 2019 magazine. This quilt pattern appeared in the QuiltCon 2019 issue of Modern Patchwork magazine and hung at QuiltCon 2019. I was inspired by the American Patchwork & Quilting two-color quilt challenge to design this HST/HRT heavy quilt in Kona ice peach and Windsor. This design makes clever use of economy blocks and flying geese to create seamless star motifs that are perfect for solids or for showcasing some fussy-cut prints. This pattern is available in the April 2019 issue. 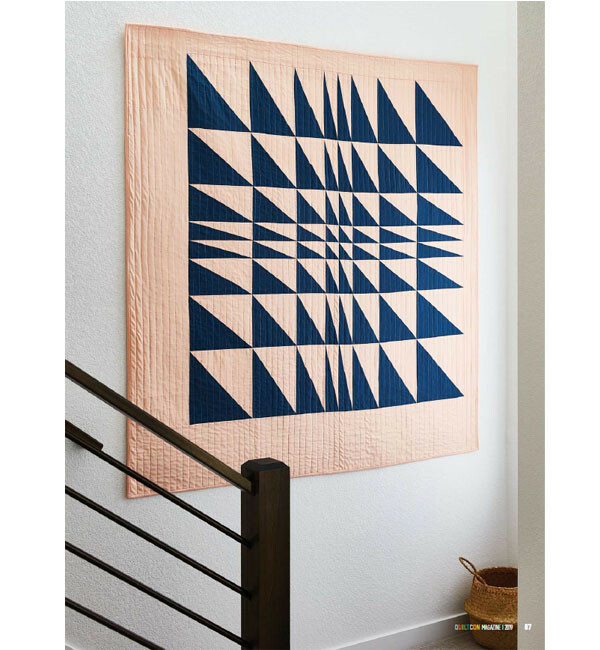 This quilt takes the classic Sawtooth Star motif and modernizes with with an asymmetrical color-block element. This super versatile quilt design is available in the September/October 2018 issue or on their website. I’ll be re-releasing this pattern later this year! This soft and pretty combination of HSTs and flying geese appeared in the 2018 Christmas issue of LPQ. Again, it made heavy use of Kona cottons in a palette that is perfect for leaving out all winter long. I’ll be re-releasing this pattern later this year!